In Windows 8.1 you can search for apps and more than apps, including settings and files. To use Search in any app, display the charms bar and select the Search charm. For example, search for a city in the Weather or Travel apps. 1On the Start screen, type calc (the first four letters of the word calculator). The Search panel appears on the right side of the screen, with the letters you type in a box in the upper right of the screen. The Search panel below the box lists app names, program names, settings, files, and web pages with the term you entered. You can search for just about anything by typing when the Start screen is displayed. 2Type ulator to finish typing the word calculator. The Search panel lists only items with the complete word calculator in them, including the Windows 8.1 Calculator program and the Calculator app. 3Select the Calculator program to open it on the desktop. 4Return to the Start screen. Click the Windows button in the lower-left corner of the desktop, swipe in from the left edge of the screen, or press the Windows key. 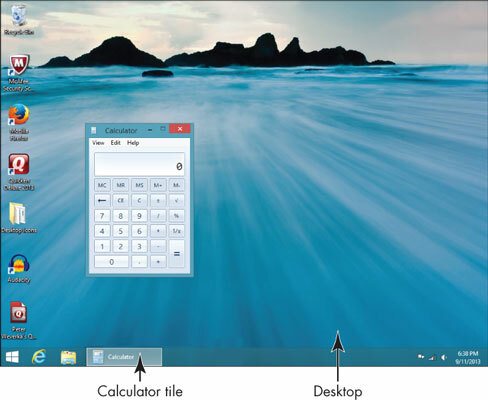 5Repeat the steps you just used to switch back and forth between the Start screen and the Calculator app on the desktop. Switch to the Start screen. Mouse: Move the pointer to the upper-left corner to reveal the desktop thumbnail. Move the pointer down the left side of the screen without clicking to display the app switcher. Drag the desktop thumbnail to the right; drag a little to split the screen or more to fill the screen. Touchscreen: Swipe from the left edge of the screen and back to display the app switcher. Swipe the desktop thumbnail to the right slowly to split the screen or quickly to fill the screen. Keyboard: Press Windows+Tab until the desktop thumbnail is highlighted, then release both keys. You can use two keystrokes to switch to desktop apps. Press Alt+Tab to display thumbnails for open Windows 8.1 apps, open desktop apps, and the desktop itself. Press Windows+D to switch from the Start screen to the desktop. If your screen resolution allows, you can snap the desktop beside other apps. This procedure works best when the desktop is in the larger part of the screen. Note that you can snap only the entire desktop, not individual desktop apps. Mouse: Move the mouse pointer to the top center of the desktop until the pointer changes into an open hand. Drag down until part of the desktop is off the screen, and then release the mouse button to close the desktop. Touchscreen: Swipe down from the top edge until part of the desktop is off the screen. These methods close both the Calculator and the desktop. To close only the Calculator, switch to the desktop and click the white X in the red box in the upper-right corner of the Calculator.